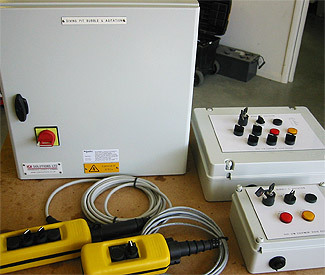 Diving Pit Bubble Control Panel. A simple panel to control the release of bubbles in a diving pool to give a cushion of air for training divers when practicing new and complex techniques. Also an agitation function will give a small amount of air to agitate the surface just below the board for the diver to visualize the waterline from the higher boards. A robust hand held pendant to be used poolside for the coach to select and operate the features on the particular boards throughout the facility. Provision of a local panel poolside to plug the pendent into and a remote panel to control the various solenoids for air release.